Take an off-road truck and meld it with a racecar. 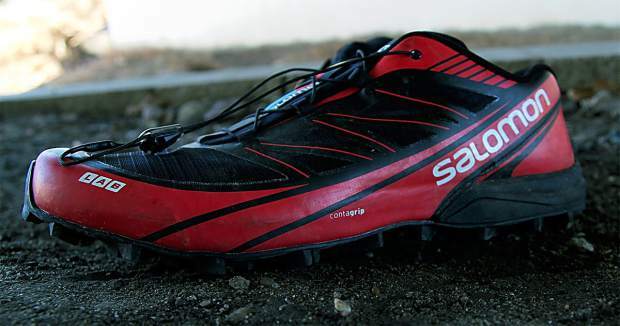 Turn that into a shoe, and you get something like the S-LAB Fellcross 3 from Salomon. Made for running on muddy trails, grass, sand and snow, the Fellcross was designed to be fast in places where most footwear slips or fails. I tested the high-tech, high-price shoes this month as snowdrifts melted into mud. The grip underfoot, bolstered by more than 40 quarter-inch lugs, is unsurprisingly solid. The shoe remains flexible despite an aggressive sole. The mid-sole is thin, letting the shoe flex and meld to the terrain. Its upper is water-resistant but not puddle-proof. The shoe hugs your foot in a soft but tough synthetic material with welded overlays and dense mesh. On the trail, the Fellcross gave confidence where things got sloppy. Steep paths with loose footing, as well as variable off-trail forest or alpine terrain, is the venue for these specialty shoes. Don’t plan to run on the road or compacted, rocky trails. There is little cushioning by design, and the shoe is not made for hard surfaces. They come with a pro-level price tag of $170. Look to the Fellcross if you’re a serious runner in need of a shoe for seriously steep, sloppy, muddy terrain.